William Sherlock Scott Holmes was born in 1854, the third son of Siger and Violet Sherrinford Holmes. He has two older brothers, Mycroft Holmes (Founding Member of the Diogenese Club) and Sherrinford Holmes. 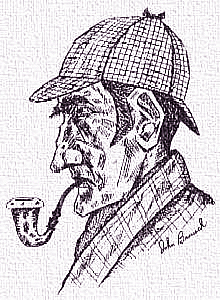 He is a well-known Consulting Detective and lives in Baker Street, London, where he writes, studies various areas of interest and practices the Art of Detection with the able assistance of Dr. John H. Watson.